Gain insights into your hospitalists’ on-the-job satisfaction and the likelihood of retention. The cost of recruiting new hospitalists can easily exceed $10,000 per individual, and with the average turnover rate of 12.5% to 18%, recruitment can add significant costs financially. Conversely, retaining hospitalists can reduce costs. Research shows that an experienced hospitalist (2+ years) can reduce healthcare costs by $800 per case and decrease length of stay by a half-a-day. 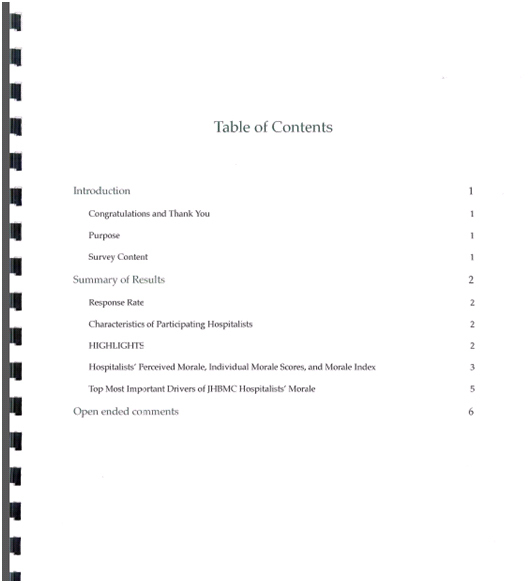 The Hospitalist Engagement and Retention Survey is a report that rates hospitalists’ morale (in the full range of hospital settings) based upon a survey of hospitalists, implemented by Johns Hopkins. The results include a score that can be compared to other hospitals to help you gauge your staff against the national average so that steps can be taken to improve morale and retention. Hospital medicine is the fastest growing medical specialty in the past 25 years, with an estimated 30,000 hospitalists across the United States and an estimated need for 45,000 to 60,000 more in the coming years. Hospitalists tend to be relatively early in their career, and given that demand exceeds supply, they are often able to change jobs easily. Perhaps for that reason, Hospitalists are likely to be sensitive to work-life balance and career satisfaction. Most hospitals do not currently measure morale, at least not through a standardized measurement tool. They rely on luck or leadership to help navigate these issues with varying success. Standard staff surveys do not often adequately address issues crucial to hospitalists. The Hospitalist Engagement and Retention Survey surveys hospitalists in a hospital. 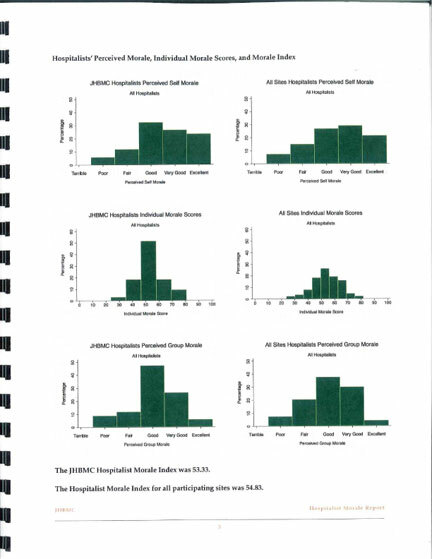 It is being used throughout the Johns Hopkins-affiliated hospitals so that hospital and department leaders/managers can adequately measure hospitalist morale and help identify areas for programmatic improvement, with the aim to increase overall hospitalist satisfaction and retention rates. The survey results are analyzed by Johns Hopkins hospitalists and biostatisticians and incorporated into a report that includes a score that can be compared to other hospitals to help you gauge your staff against the national average. With this report, hospital leadership can address existing problems in an effort to retain experienced and valuable hospitalists. 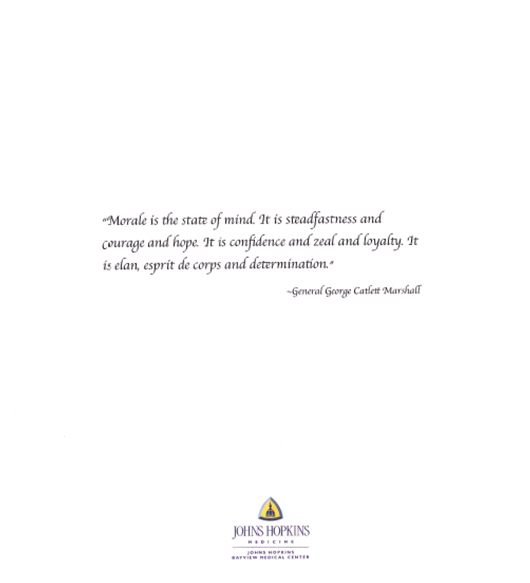 The survey was developed in 2009 by the hospitalists at the Johns Hopkins Bayview Medical Center, one of the oldest hospitalist programs in the United States. The goal was to survey our own hospital medicine staff. 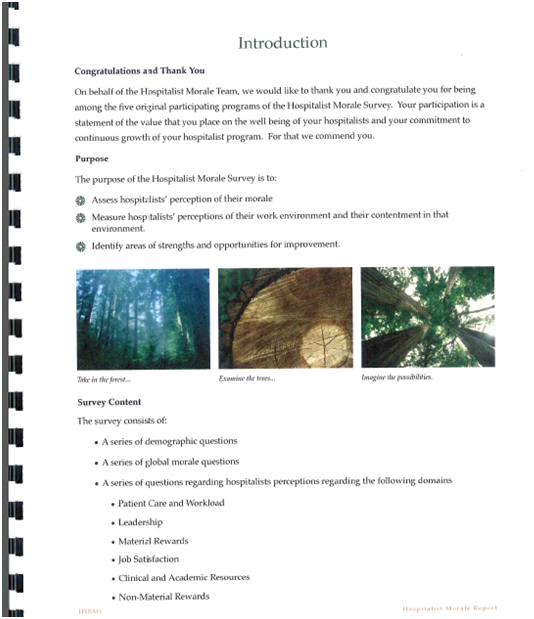 The results were illuminating, and we set out to refine and expand the survey questions (now at approximately 50) and conduct the survey at other Johns Hopkins Health System sites, so that hospital and department leaders/managers can adequately measure hospitalist morale and help identify areas for programmatic improvement, with the aim to increase overall hospitalist satisfaction and retention rates.